In an unusual Saturday morning vote, the Senate passed the defense spending bill. The health care bill still awaits. Washington (CNN) -- The Senate passed a $636 million defense spending bill Saturday by an 88-10 vote. Debate on the bill wrapped up Friday, setting the stage for the unusual Saturday morning final vote on the measure. The Senate voted 63-33 Friday morning to end debate on the measure -- three votes more than required to break a GOP filibuster. Under Senate rules, 30 hours must pass before final passage, which would in turn allow the chamber to resume consideration of the politically contentious health care bill. Democrats said Republicans tried to slow consideration of the defense bill largely to prevent the passage of health care legislation before the Democrats' self-imposed Christmas deadline. 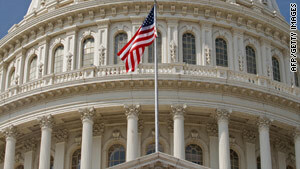 The House of Representatives passed the spending bill 395-34 Wednesday. The measure includes money for the wars in Iraq and Afghanistan but does not cover additional costs expected for the 30,000 U.S. troops the Obama administration announced it will send to Afghanistan next year. A separate request for those troops is expected to come up for a vote next spring. Democrats also tacked onto the bill short-term extensions of several programs set to expire at the end of 2009, including a two-month extension of unemployment assistance and health care coverage for those who have lost their jobs. And because the defense bill is the last spending measure both chambers of Congress will vote on this year, Democratic leaders also attached other extensions for programs they were unable to tackle by year's end. To head off a major cut in payments to doctors, the bill keeps in place for two more months the current rates Medicare pays to physicians. The temporary "doc fix" delays until next year the debate over how to pay for a permanent fix for these rates. The bill also extends some key provisions of the Patriot Act for two months. House Democrats wanted to include a six-month continuation of those items but were forced to scale back because Senate Democratic leaders made it clear they would not be able to pass a longer extension this year. Tensions were palpable on the Senate floor early Friday, with Democrats suggesting Republicans were sacrificing the defense of the nation to stall overhauling health care. "Many who are filibustering this defense appropriations bill tonight are filibustering because they want to delay ... the health care reform legislation from being voted on," said Sen. Carl Levin, D-Michigan. "So the bill that provides the funding to support our men and women in uniform who are serving on the front lines, often under arduous and dangerous circumstances, to protect our nation is being filibustered to keep the Senate from acting on another unrelated piece of legislation. This is not only unbelievable; it is unconscionable." But the Republican whip, Sen. Jon Kyl, R-Arizona, was having none of it. "Don't blame Republicans for the fact that this bill comes before us a week before Christmas and, therefore, we have to act on it at this point in time. Republicans had nothing to do with that timing," Kyl said. Will Senate be working over holiday recess?